Belden, a developer of signal transmission products for the enterprise, industrial, broadcast, residential and security markets, announced the availability of the Belden Wireless Solution. The architecture of the Belden Wireless Solution is fundamentally different: While standard WLANs use cell-based technologies that require complex RF Cell Planning in an attempt to avoid co-channel interference, the Belden Wireless Solution uses a unique Channel Blanket topology to allow each radio channel to be used everywhere, at every access point, thereby creating blankets of continuous wireless coverage with no roaming latency or co-channel interference problems. Equally important, high throughput is achieved even when cell traffic is high. Full compliance with IEEE 802.11a/b/g protocol and security standards is maintained. Provides unmatched capacity and bandwidth, covering the entire enterprise with overlapping blankets on independent channels. Ensures seamless, zero AP-to-AP hand off mobility for latency sensitive applications such as voice and video. Is exceptionally easy to deploy, configure, validate and maintain, providing plug-n-play flexibility to add or remove APs with no effect on the existing setup. Allows for a true future-proof infrastructure in anticipation of fixed/mobile convergence of voice (VoWLAN), data and video in wide-reaching WLAN deployments. No other enterprise-capable wireless networking technology has these application capabilities. Network managers and administrators also benefit from Belden's Wireless Solution as it eliminates the need for intricate radio frequency (RF) cell designs and complex site surveys. Only a rudimentary understanding of wireless is needed. These factors make implementation of the Belden Wireless Solution just as straightforward as it would be for a hard-wired LAN. In addition, Belden has further simplified the implementation process by including an easy-to-use software tool for determining the number of APs needed. BWS-8008 (8-port) and BWS-8024 (24-port) Switches, which are PoE enabled eliminating the need for a midspan or endspan device. The Belden switches control all aspects of cell traffic and user access, providing for the coexistence of all types of users, devices and applications. This guarantees performance and quality of service (QoS) for all users. 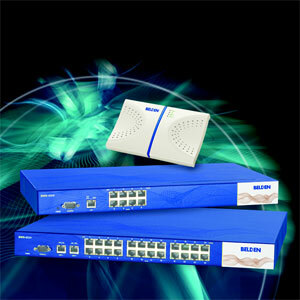 BWAP-200 "Thin" Access Points (APs) which provide true plug-and-play functionality. With all software and processing intelligence built in to the Belden wireless switch, the Belden APs require no configuration and are easily interchangeable or replaced with any other BWAP-200 AP. The Belden APs never need to be configured, rebooted or otherwise maintained since they are under the complete control of the Belden switches. Software, which manages the operation of the Belden switches, allowing clients to associate directly with the switch and not the access point. In addition to managing all client associations, the software also provides a bullet-proof suite of standards-based security choices including WPA-2. This centralized software/switch control technology means that the APs are secure and removes the possibility of enabling a possible security breach.